I wanted to see the SITL simulator running on my MacOS. The wiki vagrant instructions got me a fair way, but I discovered I needed some extra flags (vagrant ssh -- -X) and dependencies (XQuartz). 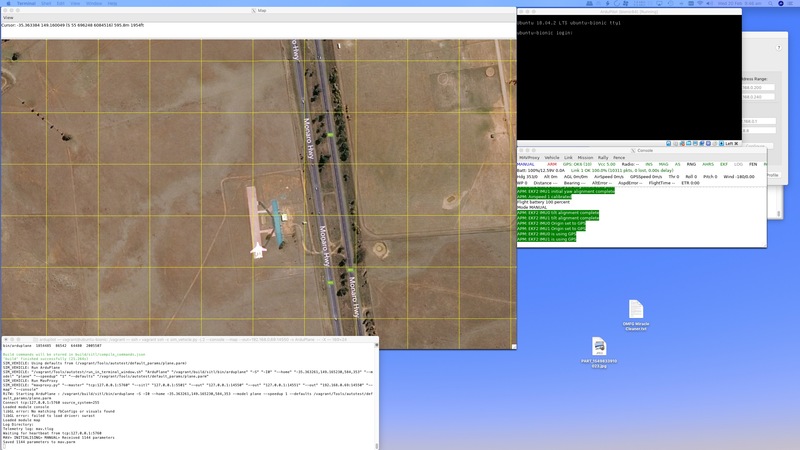 [Ardupilot Simulation](http://ardupilot.org/dev/docs/simulation-2.html)  (SITL - Simulation In The Loop)  allows for safe testing of experimental code and settings and crashing virtual vehicles is a lot cheaper than crashing real ones! It was written for X11/Linux. Fortunately thanks to Vagrant and XQuartz it can be run on MacOS. If anyone has any optimizations/improvements, please let me know. I’m still learning how all the ground control + SITL + firmware works together. Towards running SITL within Docker, https://sourabhbajaj.com/blog/2017/02/07/gui-applications-docker-mac/ looks to be a good set of instructions for X11 forwarding + docker. And https://github.com/moby/moby/issues/8710#issuecomment-456062944 for some OS X instructions for socat. Am I missing something with vagrant? It complains about a default provider when vagrant up is initiated. @mboland I’m sorry if I’ve missed some “getting started with vagrant” steps. Can you let me know what the error output looks like and I’ll help hunt down how to setup vagrant etc and fix up the instructions for you. So which provider do I need to specify? Have I neglected to install something? Ok I’ve added a link to download VirtualBox. So try installing VirtualBox https://www.virtualbox.org/wiki/Downloads and running vagrant up aagain. Have all the listed components installed, XQuartz, Vagrant, VirtualBox. 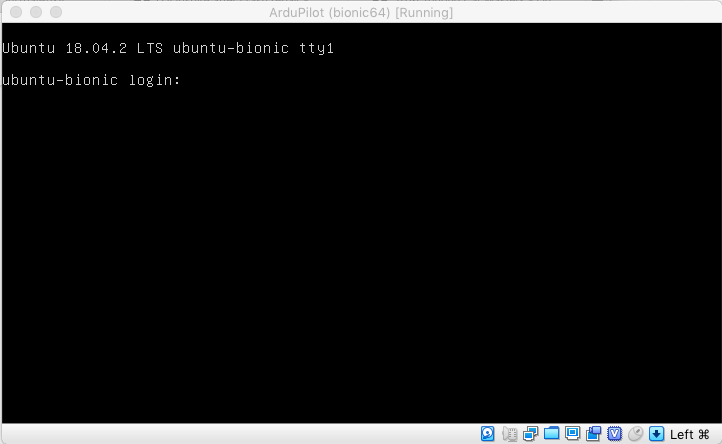 Have cloned Ardupilot following each command. ==> bionic64: flag to force provisioning. Provisioners marked to run always will still run. Now I know I must not be holding my tongue right, or failed to install something, but I am trying to faithfully follow your Tutorial. I don’t know why the Vagrantfile is configured to have a visible virtualbox terminal window; I’ve never seen this with Vagrantfiles before. So I ignore that window myself; and vagrant ssh to get a clean ssh terminal. If I remember from when I was trying to get this all working, that error was related to xquartz not running or not accessible. I’ll go and try to reproduce it myself. Ok I was able to reproduce your error output and fortunately I learned the fix to this whilst working on a Dockerfile + instructions. The xhost... command will launch Xquartz. Fingers crossed this all works for you now! Thanks for trying out the instructions and helping me debug them. around with remote X etc etc. Sadly, we didn’t get to that. Thanks Peter, I appreciate the backstory/history. Was running vagrant ssh an unpleasant experience that you were trying to avoid? Or did you want the initial ssh window to do something specific on start? I’ll submit a PR to quieten the virtualbox window for now until you/someone comes back to the idea. And/or perhaps I can add some features whilst I’m dabbling with Vagrantfile/Dockerfiles at the moment. I have had some success. If I start from scratch I get the same ‘sleeping’ error as above. and I was able to get what appears to be the SITL environment working. But it’s always a learning curve. What directory do I need to be in? Do I need XQuartz open? Sorry to sound like a dummy with this but I have only basic terminal knowledge, just enough to get me into trouble. Thanks for that it seemed to work. It would arm, set mode, but I could not get it to obey other commands like start mission etc. Getting there, but obviously I have a lot more reading to do about SITL. Thanks guys for all the assistance.